Explanation: Colorful and bright, the city lights of Vancouver, Canada are reflected in the water in this portrait of the world at night. Recorded on August 12 during the Perseid Meteor Shower, the wide-angle view takes in a large swath along the photographer's eastern horizon. The picture is a composite of many consecutive 2 second exposures that, when added together, cover a total time of an hour and 33 minutes. 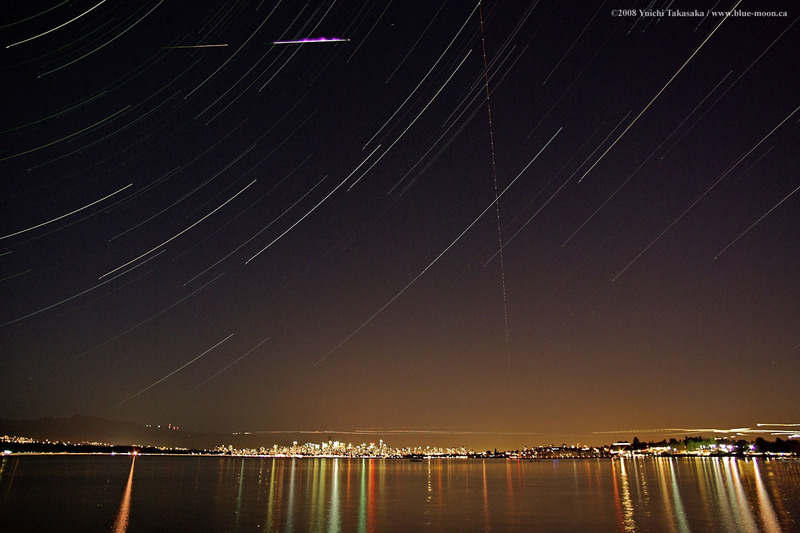 During that time, stars trailed through the night sky above Vancouver, their steady motion along concentric arcs a reflection of planet Earth's rotation. The dotted trails of aircraft also cut across the scene. Of course, two of the frames captured the brief, brilliant flash of a Perseid fireball as it tracked across the top of the field of view. The large gap in the single meteor trail corresponds to the time gap between the consecutive frames.